Fall weekends were meant for outside adventures! Thankfully the U.S has a staggering array of State Parks and chances are there is one within a manageable (i.e. drivable or public transport) distance from you. Whether you are a seasoned hiker, or new to the trails, knowing what to pack is key for maximizing your day in nature. It is essential to have gear that is durable and functional, yet lightweight enough to allow you to move easily through any terrain. 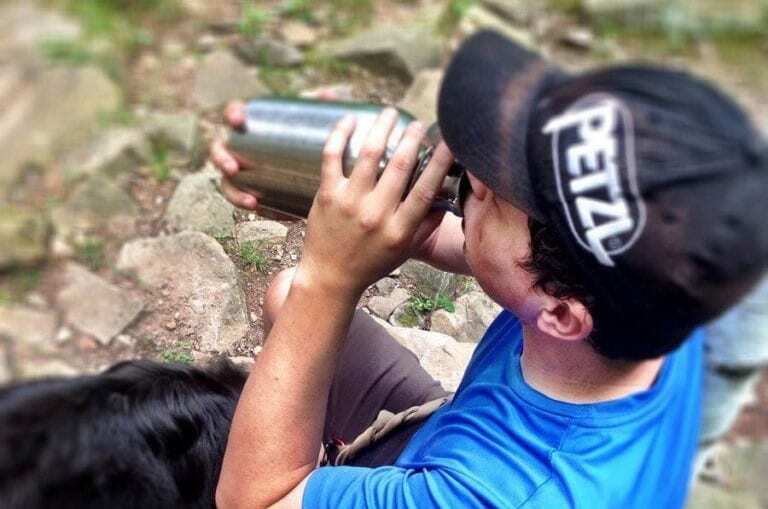 We have assembled this packing list around bringing a 32oz Howler and 12oz stainless steel pint glass (obviously you would want more glasses if your group was larger). With this list of necessities, you won’t have to second-guess yourself when hitting the trails. ParkFinder app: Download it to your phone to have access to all the information on parks near your location. Check the app before heading out, bookmark the important maps, and save the ranger number to your contacts list. Weather app: Bad weather or a sudden rainstorm can derail a day hike. Stay informed and get suggestions on weather appropriate gear/clothing-all delivered by a weatherman cat. This usually comes with a first aid kit, but in case it doesn’t it’s good to purchase one. If you need convincing just Google search hikers saved by whistles. This may be no -brainer for some, but really, safety is of highest importance. Bringing your phone can give you the ability to ring the ranger station or take a picture of what could be poison ivy. The most important factor when choosing a backpack is making sure the pack fits your frame and body type. There are few things worse that getting 2 hours into a long day hike and realizing the pack was made for a 6 ft. 4in male and you are 5 ft. 4in tall. Headaches from sunlight are common on the trail! Avoid this annoyance by bringing along a pair. Even on overcast days, glare can obstruct vision, so don’t take the risk and stash a pair. Mosquitoes are bad, wood ticks are worse. Save yourself the pain of itchy bumps and horrific ticks by using bug spray generously. Your mom will thank us for this one! Sunburn can ruin your day. Be sure to apply every 3 hours. Extra bonus points if you pack a sport sunscreen with sweat proof abilities. For spills, cuts, and bathroom breaks, these are an essential! Perfect for carrying your favorite craft beer, this stainless steel Howler can also be used to carry water. No Howler is complete without a pint glass. Sweat proof, indestructible and lightweight, this is the perfect outdoor accessory! There is a reason it’s called trail mix. Its perfect to give you energy when out finding adventure, without taking up too much room. A word of caution, while chocolate is tasty, it makes a mess in a hot pack. Go for a mix that has dried fruit and something salty like pretzels. An old favorite, granola bars have come a long way. From organic to nearly a candy bar, there is sure to be a flavor or brand you like. A good rule is to pack one granola bar an hour for heading out and one an hour for heading back towards the trailhead or car. Obviously this depends on terrain and weather, so be smart! Depending on how long you are hiking and the temperature/conditions this will vary. A good rule of thumb for a moderate hike ½ liter an hour per person. Like the food suggestion above, be smart and stay hydrated in hot weather. Most state parks have bins, but often when out on the trail, there are no trash areas. Bring along a bag so you don’t litter or stink up your pack. If you hike with children (or are a kid at heart), this is a necessity! Kids collect things, and love to pick up flowers, rocks and interesting sticks. Have a bag handy so you are not stuck toting around their treasures. You will take breaks on the hike, why not make it comfortable! The options for picnic blanket vary from those with LED lights to ultralight tarps. What is important is to have a stuff sack or bag for the blanket, and be able to stash it in your pack. If sitting on the ground isn’t your thing, try a hammock. The most popular brands pack down to the size of a small grapefruit and hardly weigh anything.